Can you conquer the dark dungeon and reach the treasure, or will you stumble into too many hidden traps? 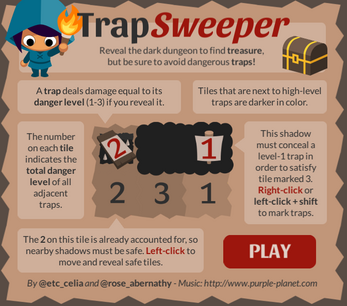 TrapSweeper is a cute and challenging version of Minesweeper where traps can have different danger levels (1 - 3), and tile numbers indicate the total danger level of all adjacent traps. 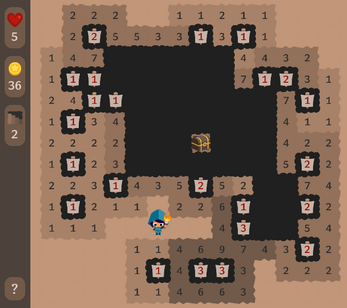 Avoid traps and reach the treasure in the center to venture deeper into the dungeon. The best treasure is on level 10 - if you can make it that far! 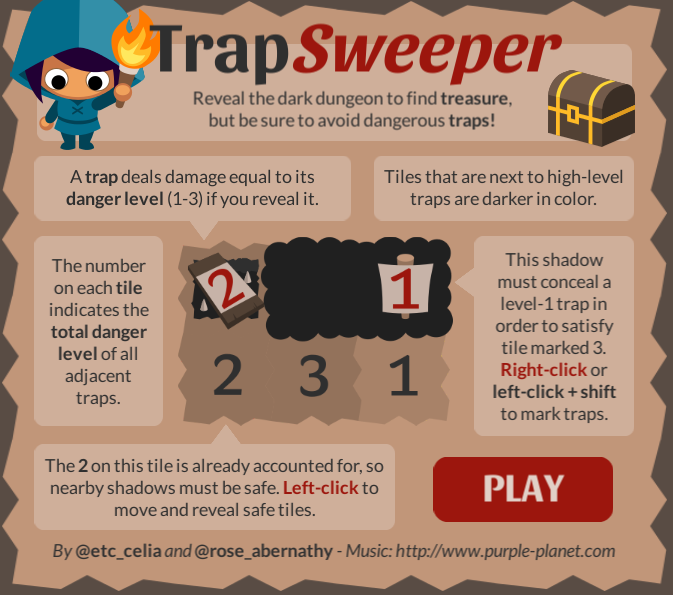 Right-click (or left-click + shift) to mark tiles that you've deduced contain a trap. Click again to increase the number. Keep clicking to remove the marker entirely if you made a mistake. Start by looking for numbered tiles that are adjacent to just one dark tile, such as ones in the corner. That tile must contain a trap equal to the number in the corner. When you've marked enough adjacent traps to match the number on a tile, all the other adjacent tiles must be safe and can be revealed - don't forget the diagonals. Tiles are colored based on the highest-level trap they're next to. Use this information to eliminate possibilities if you get stuck. Totally stuck? If you trigger a trap, you'll take damage, but you can walk across it and keep going.